A guest post from Dr Ken McNamara, Director of the Sedgwick Museum, Cambridge, who is giving a talk on Dr John Woodward, ‘A droll sort of philosopher’, on Monday 24th February, 7pm at Two Temple Place, London. To book, call 0207 240 6044. 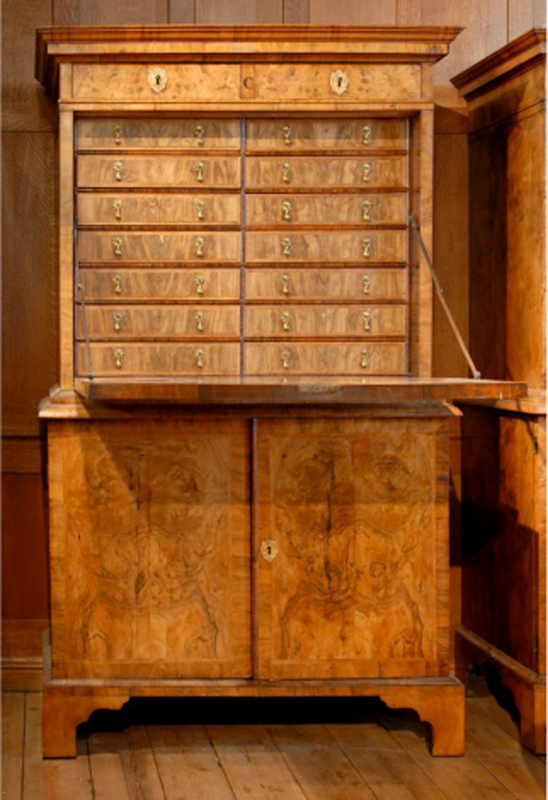 For three hundred years, 5 beautiful walnut veneer cabinets, like elegant Regency secretaires, have been the home to almost 10,000 “Fossils of all Kinds” in the University of Cambridge. These were originally the personal collection of Dr John Woodward (1665 (or 8) – 1728). Professor of Physick at Gresham College, Fellow of the Royal Society and “a vain, foolish and affected man”, Woodward was an enigma. 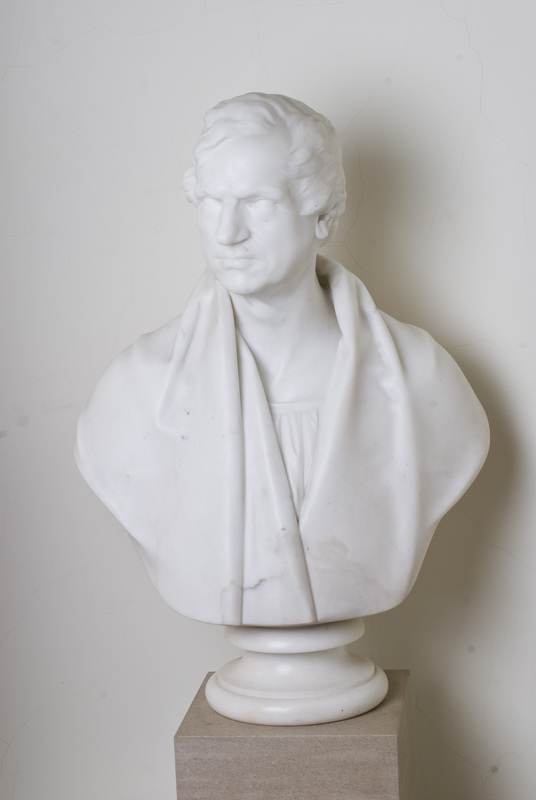 Reviled by most of his contemporaries, who thought him a conceited, vain, arrogant popinjay, he was a man who played a crucial role in initiating the science of geology. This was not so much by what he did during his life, but by what he left behind after his death. One bequest was £100 per year to endow a position of ‘lecturer’ in the University of Cambridge; the second was his collection of fossils, rocks and minerals, which he also left to the university. The legacy of these two munificent deeds, was the establishment of the most continuous and oldest professorship in geology in the world – which to date has had 17 occupants – the Woodwardian Professors, and the establishment of what is arguably the oldest geological museum in the world. Formerly called the Woodwardian Museum, it is still going strong in the guise of the Sedgwick Museum. One of the five cabinets housing Woodward’s collection. What is remarkable about this collection is that it has remained intact for so long. This is largely due to Woodward’s foresight. In his will he stipulated that the collection was to be made available for public viewing “to shew the said Fossils gratis, to all such curious and intelligent persons as shall desire a view of them for their information and instruction”. Moreover, Woodward specified that the collection should be audited each year. This meant that, unlike other contemporary collections that were dispersed on the death of their owners, Woodward’s has remained complete. Woodward was an avid collector himself, but rather than, as was fashionable at the time, constructing yet another “Cabinet of Curiosities’, he argued that collections such as these should be used for the advancement of knowledge. In an article published in 1728, the year he died, but probably written some 30 years earlier, he wrote “Brief Descriptions for making Observations and Collections…” of fossils, mineral and rocks. What it was necessary to do was to attach “…a Number upon it… Then in the Register, enter Numbers, answering those fix’d on the Fossils, what Sort of Fossil or Mineral ‘tis reputed to be… Where ‘twas found…whether it was found on the Surface of the Earth” and so on. This was all most laudable, and this is probably the first comprehensive description of how natural history collections should be curated. Woodward’s views on fossils were also very advanced for the time. Unlike many of his contemporaries, such as Robert Plot and Martin Lister, who considered that fossils were little more than ‘sports of nature’ created by some ‘plastic virtue latent within the Earth’, Woodward regarded them as the remains of once living organisms, a view shared by Robert Hooke and John Ray. 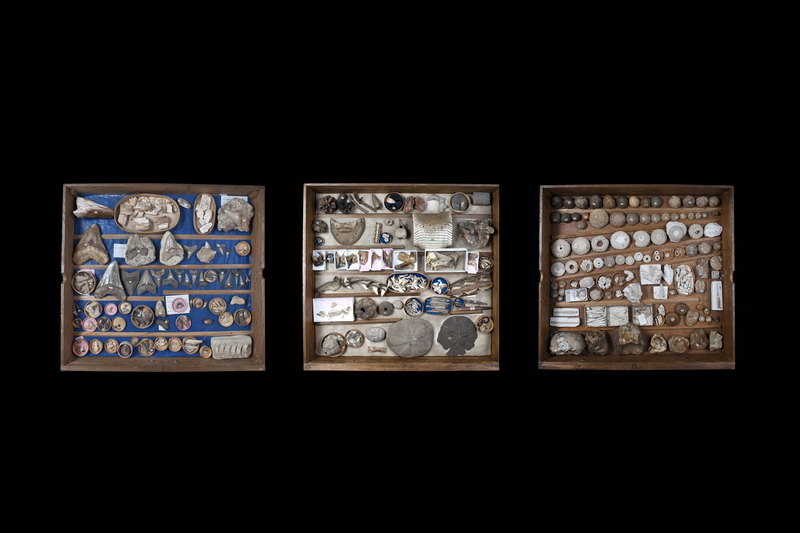 Woodward collected many of his English fossils, minerals and rocks himself, though latterly, as his medical practice grew, he employed assistants to help him. It is a testament to his meticulous recording of details of his specimens in his published catalogue (1728) that we even know which was the very first fossil he found (a Jurassic brachiopod from the Cotswolds that he collected on January 13, 1690), now on display in the Sedgwick Museum. 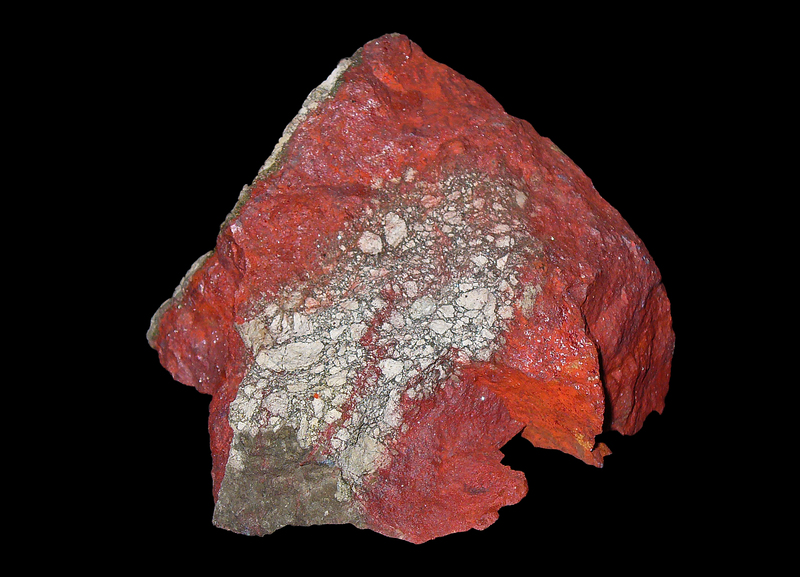 Cinnabar, the common ore of mercury. Woodward also had an amazing group of contacts in England and scattered around the world (some say more than 500) who provided him with specimens. These included Isaac Newton and Christopher Wren. The five specimens that Newton gave to Woodward were all the mineral cinnabar. Interestingly this mercury ore was much used in alchemical experiments and Newton may well have used the specimens for this purpose. Woodward also received specimens from the explorer William Dampier (the first Englishman to land in Australia, 100 years before James Cook). Dampier presented Woodward with two ethnographic objects. The axe and slingshot, which are on display in the Sedgwick Museum, represent the first ethnographic objects collected from the South Pacific by Europeans. 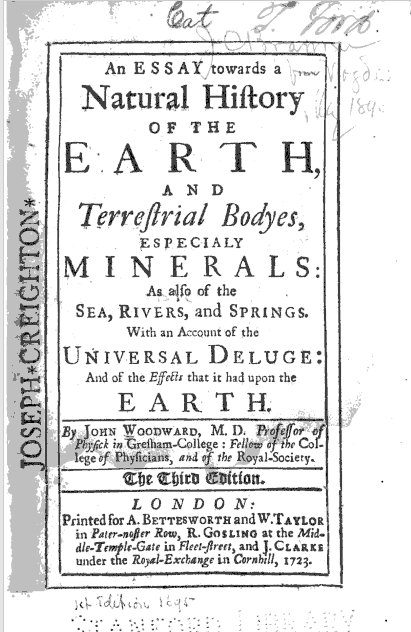 Woodward’s main aim in amassing this very comprehensive collection was to provide an authoritative basis for his most influential book, ‘An Essay Toward a Natural History of the Earth’ that was published in 1685. But his book is where it all went horribly wrong. 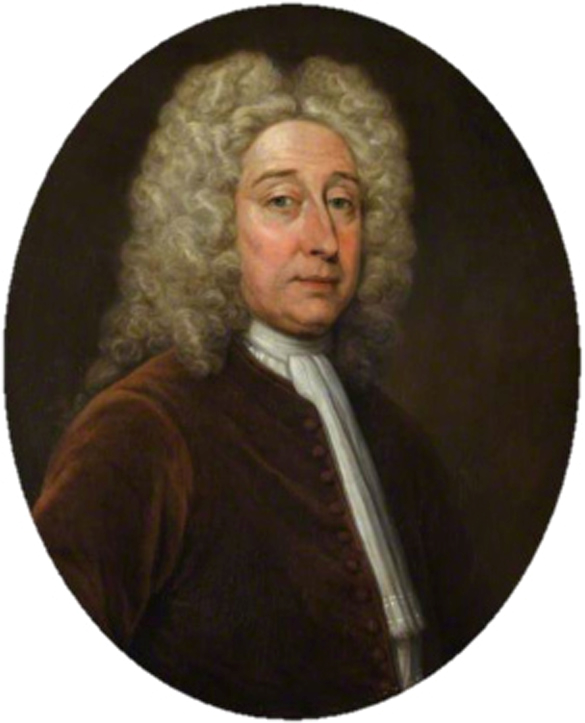 In the great philosophical debate that took place during the late 17th and early 18th centuries between the “Ancients” (people like Pope, Swift, Gay and Arbuthnot) and the “Moderns” (Newton, Hooke, Boyle), Woodward was firmly with the latter in arguing that the only way to understand the world was by undertaking meticulous observations and experiments, not by harking back to the views of classical writers. Woodward’s mistake was a lapse into the Ancients way of thinking, clinging to that most antiquated of ideas, the biblical explanation for the formation of the Earth – in the Universal Flood. Woodward vehemently argued that strata were laid down and the fossils incorporated within them as they settled out under the influence of gravity after this cataclysmic flood. While he had his supporters, his trenchant views were regarded with disdain by the Ancients who satirized him remorselessly. Adam Sedgwick, 1785 – 1873, President of the Geological Society 1829 – 1831. But Woodward’s book is not his legacy. His legacy is the string of Woodwardian Professors, some of whom, such as Adam Sedgwick, were to play a pivotal role in helping to establish geology as a legitimate science. Moreover, many of them added extensively to Woodward’s core collection, with the result that there are now more than 2 million geological specimens in the collection that started when Woodward picked up his first fossil. Tags: Cambridge, fossils, geology, history, palaeontology, Sedgwick museum, Woodward. Bookmark the permalink. Previous post ← Are geologists different? Reblogged this on University of Cambridge Museums. Don’t dig yourself into a hole over this gravest of bloopers! Thanks for another thought-provoking read, I enjoyed visiting. I’m writing a training manual for collection of geological samples by non-geologists … is the full text of that “Brief Descriptions for making Observations and Collections” available online somewhere? It may provide some entertaining (and sobering) colophons.